BANGALORE: Ten days before the first phase of polling for the 2019 general elections, Facebook on Monday announced that it has removed and taken down multiple pages, groups and accounts for violating the company’s policies on coordinated inauthentic behaviour or spam, including 103 such accounts on Facebook and Instagram, that originated in Pakistan. These accounts, Facebook added, were linked to individuals working for ISPR - the publicity division of Pakistan’s military establishment, or the Inter-Services Public Relations. The individuals from Pakistan’s military establishment, Facebook’s head of cyber security policy, Nathaniel Gleicher added, used fake accounts to operate “Military fan pages”, “general Pakistani interest Pages”, “Kashmir community pages”, and hobby and news pages. “They frequently posted about local and political news including topics like the Indian government, political leaders and military,” he said. While those behind these pages and accounts attempted to conceal their identities, Facebook said its investigation found a Pakistani military link, with a mix of real accounts of ISPR employees, and a network of fake accounts created by them. A majority of these violations happened last month when India and Pakistan exchanged hostilities following the Jaish-e-Mohammad sponsored Pulwama attack that killed 44 jawans of the Central Reserve Police Force. 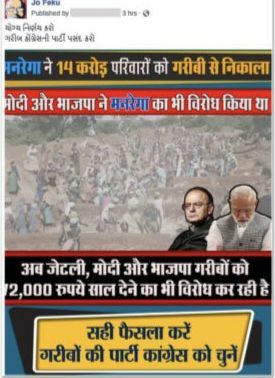 The Pakistan-based pages indulging in this behaviour included “Halka Phulka”, “Kashmir for Kashmiris”, “Pakistan Army — The Best”, and a page named “Painter’s Palette”, which ran a piece of content relating to Wing Commander Abhinandan Varthaman, who was briefly in Pakistan custody. Facebook said that this take down included 24 pages, 57 individual accounts, 7 groups and 15 Instagram accounts. It added that about 2.8 million accounts followed “one or more of these Pages”, while about 4,700 accounts “joined one of these groups”, and around 1,050 users followed “one or more of these Instagram accounts.” These accounts and pages, Facebook said, had spent $1,100 on ads on its platform, paid for in US dollars and Pakistani rupees. 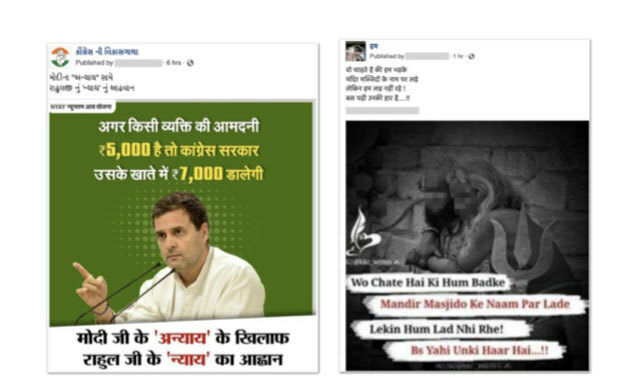 Gleicher also revealed that Facebook had taken down nearly 687 pages and accounts linked to the social media department or IT Cell of the Indian National Congress, the leading opposition party in India. He added that these accounts were removed and taken down, for creating a network of fake accounts, and importantly, concealing their identity, detected by the company’s automated systems. In its investigation, Facebook had found that a small number of Page admins and account owners belonging to individuals linked with Silver Touch, had “used a combination of authentic and fake accounts to share their content across a variety of Pages”, while attempting to conceal their identities. It added that about 15,000 accounts joined this group, while around 30,000 users followed its Instagram account. The India Eye also ran advertising on Facebook worth $70,000, paid for in Indian rupees, with the first ad it ran in June 2014, and the most recent one in February last month.